While the lawn at the side of the Broome County Dog Shelter was crusted hard with ice, eternal summertime bloomed from the fence. SUNY Broome art students finished the colorful piece of art this semester, completing a beautification project started by Chenango Valley and Whitney Point students several months ago. Students in Professor David Zeggert’s editorial illustration class were commended for their work on Dec.10, during a press conference at the dog shelter with Broome County Executive Jason Garnar. Panels feature idyllic scenes of dogs in loving homes –jumping in a pool with children, helping a girl garden and playing ball. Interspersed were familiar landmarks: The Cider Mill Playhouse, Otsiningo Park and Lupo’s. A final panel featured students wearing backpacks from all three schools involved in the project, walking down a path, each carrying a puppy. “This is incredibly creative. You certainly incorporated what the dog shelter is about, but also local history,” Garnar told students. Both Garnar and SUNY Broome President Kevin E. Drumm stressed the importance of partnership – and not only in the creation of murals.Without willing partners, SUNY Broome couldn’t offer the exceptional programs that it does, Dr. Drumm noted. “I’m always amazed – and not – by the tremendous talent our students display,” he added. From an academic standpoint, the mural project is an example of applied learning, which allows students to apply the knowledge they learn in the classroom out in the real world, Executive Vice President and Chief Academic Officer Francis Battisti reflected. “Our students had to work with a client – in this case, the county – to come up with an approved design, work within design specifications and deliver the product on time. So in a very real way, projects such as these prepare our students for future success in their careers,” Dr. Battisti said. Professor Zeggert’s students ended up painting the bulk of the project, at 110 feet. They had to integrate the previously painted panels into the design and use a limited color palette, Professor Zeggert explained. The Broome County Department of Public Works brought the fence panels to the basement of the Calice Advanced Manufacturing Center, where students spent weeks working on the project, along with Broome County Legislator Cindy O’Brien,who helped out with the paint job. Participating students include John Asare, Chyenne Barclay-Fiasco, Anthony Cooper, Kelsey Crance, Alexander Harding, Mia Hause, Kareemah Johnson, Heather Kaczynski, Brittany Lloyd, D’Lynn Molyneaux, Bailey Roma, Emily Rowe, Frank Sassano and Owen Wentz. Kareemah Johnson’s panel had a personal touch: It featured her 12-year-old daughter in a chef’s hat, carrying a cake with the words “adoption day” with the family’s husky at her feet. 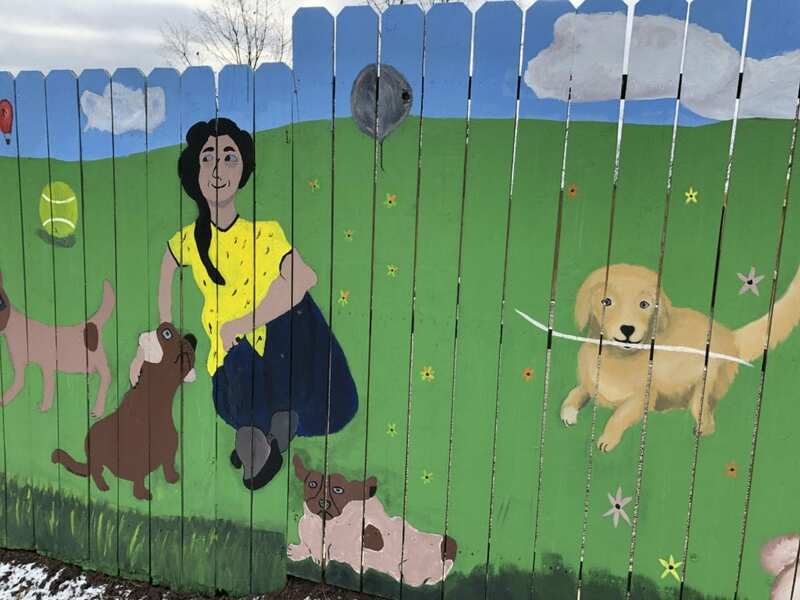 A panel from the mural SUNY Broome students painted on the Broome County Dog Shelter fence. SUNY Broome students hold dogs during a press conference at the Broome County Dog Shelter. Broome County Executive Jason Garnar speaks during a press conference at the Broome County Dog Shelter. SUNY Broome President Kevin E. Drumm speaks during a press conference at the Broome County Dog Shelter. SUNY Broome Executive Vice President Francis Battisti speaks during a press conference at the Broome County Dog Shelter.